Am I Hearing What I Think I'm Hearing? Hearing is a complicated process and the ear is a complicated organ. The ear, through its complexity, does an extraordinary job of picking up tiny pressure fluctuations in the air. These pressure fluctuations, when they occur in cycles or waves, are what we call sound. The outer ear consists of the pinna, the ear canal and the eardrum. The pinna is the outer cup-like part of the ear. It serves to catch sound and funnel it into the ear canal. The pinna also helps us detect where a sound is coming from — sound coming from different directions will bounce off the curves of the pinna in different ways that the brain can distinguish and interpret. The ear canal is a tube through which sound travels before reaching the eardrum. The eardrum is a thin membrane that vibrates with the slightest movement of air. It will vibrate more quickly for higher frequency sounds and more slowly for low frequency sounds. We hear high frequency sounds as higher in pitch and low frequency sounds as lower in pitch. In addition to transmitting sound to the middle ear, the eardrum can be tightened to help protect the inner ear from very loud, and potentially damaging, sounds. This tightening is called the acoustic reflex. If the brain perceives a loud sound, it tells the muscles near the ear canal to contract. This causes the eardrum to be less flexible and to transmit less vibration to the middle and inner ear, protecting the ear from damage. The middle ear consists of the ossicles, the three smallest bones in our bodies, and the oval window (the separation between the middle and inner ear). The three ossicles are connected in a chain between the eardrum and the much smaller oval window. 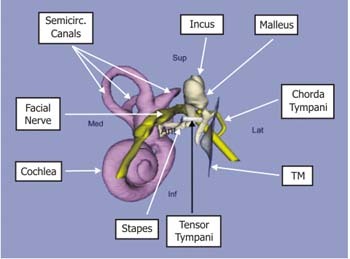 This chain of bones includes the malleus, the incus, and the stapes. These are more commonly called the hammer, anvil and stirrup. Sound is passed from the larger eardrum membrane through the three bones. The footplate of the stirrup fits in the smaller oval window membrane, amplifying (or strengthening) the vibrations that enter the fluid-filled inner ear. This occurs because smaller vibrations over a larger area, the eardrum, are leveraged through the bones to create bigger vibrations over a smaller area, the oval window. The inner ear lies beyond the oval window and consists of the cochlea, a snail shell-shaped bone structure, and the vestibular system, which helps control balance. The cochlea is filled with fluid that transmits waves to the basilar membrane, a tapered membrane that splits the cochlea widthwise in two. The basilar membrane is lined with hair cells that are connected to nerves that send the vibrations signals to the brain for perception and interpretation. For a 3D animation of the ear, check out this video. For more information on How the Ear works, check out this video. Hearing is a complicated process with several steps that alter sound's original form. The sound that you hear is not an exact representation of the pressure waves that reach your ear. Figure 1. Anatomy of the Middle and Inner Ear. Perception of the loudness of a sound - Sounds carry a certain amount of energy. The ratio of energy between the sounds we can just barely hear and the sounds that are so loud that they cause us pain is about one to ten trillion. However, we don't hear the painful sound as being ten trillion times louder than the sound we can just barely hear. An increase of 10 decibel (dB) in a 1 kilohertz (1 thousand vibrations cycles per second) sound is perceived as twice as loud. This is why we use the decibel, a logarithmic scale, to measure loudness. A logarithmic scale more closely mirrors the way we hear. Perception of different loudness for sounds of equal intensity level but different frequency (different pitch) - People can hear frequencies in the range of about 20 hertz (Hz) (vibrations cycles per second) to 20,000 Hz. However, because of the structure of the ear, we are best at hearing sounds in the range of normal human speech. The relative sensitivities of human hearing have been plotted in the form of equal loudness contours as seen in Figure 2. Each line, or contour, in the graph represents the pairs of frequencies and intensity levels (measured in decibel) that sound equally loud to us. For example, a 20 Hz sound (a very low pitched sound), whose intensity level is about 75 dB higher than a 3 kHz sound (a sound closer to the pitch of a human voice) will be perceived as equally loud. These relative sensitivities differ for sounds at different intensity levels. 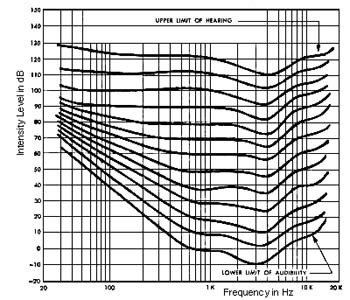 For example, a 20 Hz sound with about a 65 dB intensity level sounds equally loud as a 3 kHz sound with about a -10 dB intensity level. This is a difference of 75 dB. However, a 20 Hz sound with about a 120 dB intensity level sounds equally as loud as a 3 kHz sound with about a 110 dB intensity level. This is a difference of only 10 dB. To account for our relative sensitivities of different frequencies and intensity levels, the A, B, and C-weighted decibel scale were created. The A-weighted decibel scale weighs the loudness of sounds at different frequencies in a similar way as the ear for intensity levels of about 40 to 65 dB. Because of this, the loudness of a sound measured in A-weighted decibels (dBA) is closer to the loudness you hear at these intensity levels. The B and C-weighted decibel scales weigh the loudness of sounds at different frequencies in a similar way as the ear for intensity levels of about 65 to 85 dB and about 85 dB and above, respectively. Figure 2. Equal Loudness Contours. Most measurements of airplane noise, including the Equivalent Noise Level (LEQ) (See Noise Basics), use an A-weighted decibel scale. The LEQ is essentially the average sound level as measured by the A-weighted decibel scale over a period of time. It is used over a 24 hour period with 10 dB added to the sounds occurring between 10 pm and 7 am to calculate the Day-Night Level (DNL). The DNL is used in evaluating the noise levels in a community. Therefore, our hearing process and perception of sound are an important part of noise assessment. Elsea, Peter. "Hearing and Perception". 1996.7 October 2006. Harris, Tom. "How Hearing Works." howstuffworks.7 October 2006. Luce, R. Duncan, Sound & Hearing, Lawrence Erlbaum. 1993. pp.65-90. ISBN: 0-8058-1389-6. (Properties of the ear).